Here's a survival story along the lines of Island of the Blue Dolphins, except that it doesn't take place off the California Coast but in the frozen Arctic Sea. In the 1860's, two Inuit boys and their dog are hunting for seal when an iceberg hits their ice floe and sends it drifting into the Greenland Strait. They have no kayak and swimming to shore is impossible--even if they were close enough, the freezing water would kill them almost instantly. And it's October. They're about to go into the coldest and darkest part of the year when it can get to 40 below. And there are bears. And even if they survive the winter, what will happen in the spring when their ice floe thaws and breaks up? 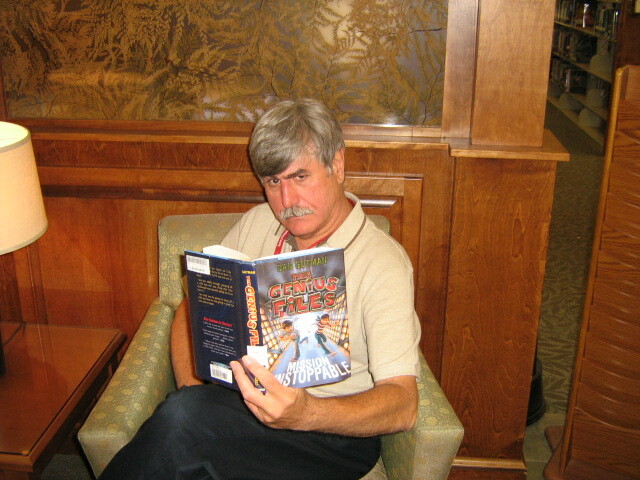 This is a good and suspenseful story, just the sort of thing for a guy to enjoy. You'll really wonder if survival is possible. This is one you're going to enjoy. Besides, it's good to read about the frozen Arctic when it gets so hot during the summer! This is another terrific book in the Alvin Ho series. These books are funny, funny, funny and each one should come with a You-Will-Laugh-Out-Loud guarantee. All of them feature second-grader Alvin Ho, who is scared of everything. Lighting storms. Getting stuck in trees. Speaking up in class. Dead authors who give tours of their houses. He evesn carries a Personal Disaster Kit which contains like like Band-Aids, a whistle (in case you're so scared you lose your voice) and Garlic for "fending off vampires and teachers." In this one, Alvin's mom is expecting a baby. She shows him the ultrasound pictures but he says it looks like an alien. Then he notices that his tummy is getting big too. Oh, no--that must mean HE'S pregnant!! He doesn't want to have a baby! Not only THAT, there's also a burglar in the area. Now Alvin's got something ELSE to be scared of! Wait--he's home alone after he fell asleep in the closet and his mom had to go to the hospital. Who's that coming up the stairs?? Could it be the BURGLAR??!! Alvin's brother rigged up a trap for burglars--WILL IT WORK??? Oh, man, you've got to read this one!! 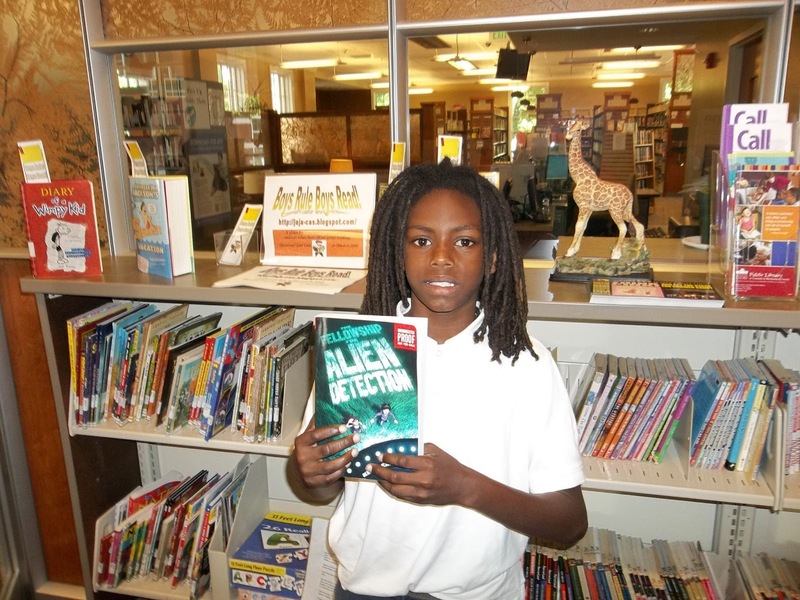 You will laugh out loud when a TV reporter shows up at Alvin's school and a classmate says Alvin's pregnant! Or when the other boys in class learn that they're pregnant! Or when Alvin solves the baby-crying problem. Or when he eats six ice cream cones and a lick in a minute and a half. So get this and have some good summer fun. 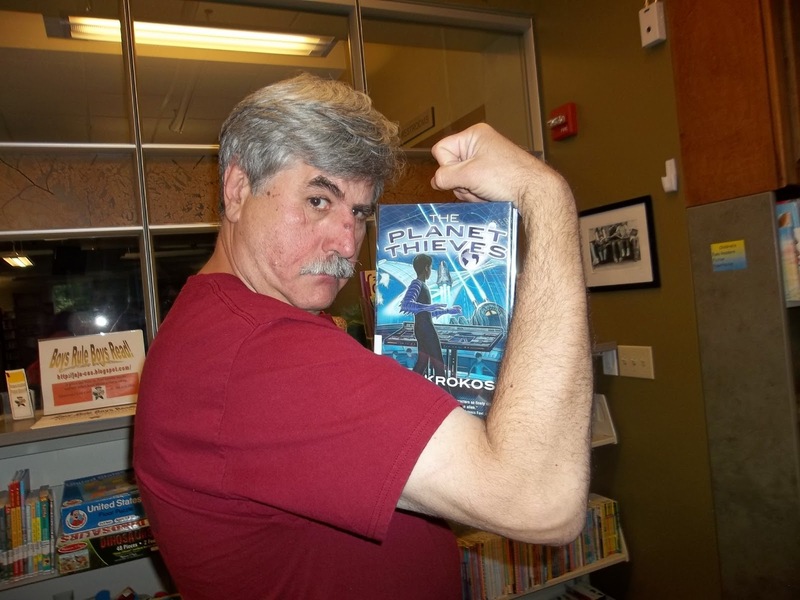 This one gets the Iron Guy Seal of Approval as One Terrific Book! 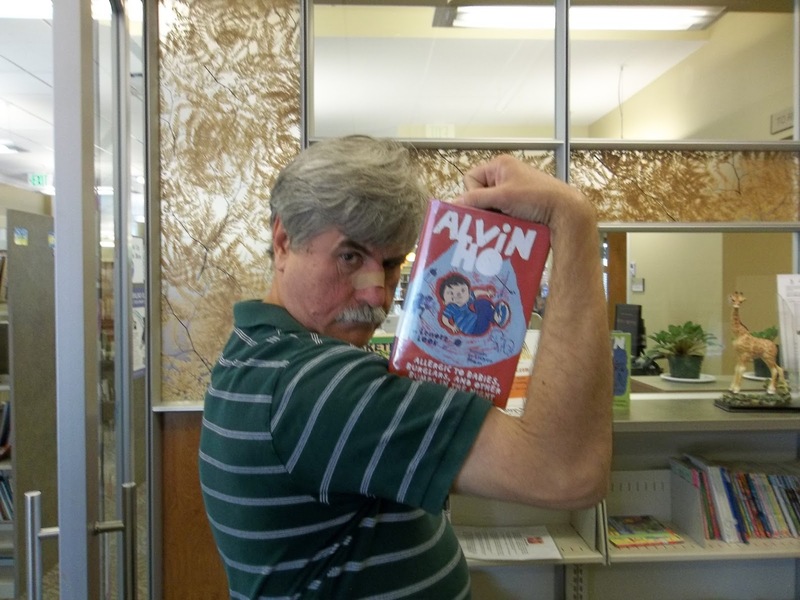 And if you'd like to find out about more Alvin Ho or survival books, click on the "Alvin Ho" or "survival stories" tab under this post. Enjoy summer and keep reading! who'll win tonight but you just gotta love the thrill of the game! 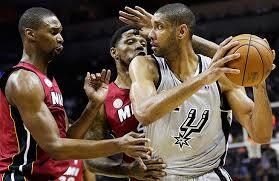 Basketball is a high-speed, high-intensity game that is just right for GUYS. 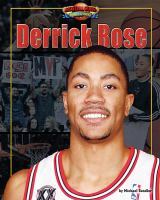 So, in the spirit of the roundball, here are basketball books that are just right for GUYS! These are good, basic books about how to play the game. Fundamental Basketball covers everything from the history of the game to how to shoot jump shots to the size of the backboard! Basketball Step-By-Step also covers the basics of scoring, equipment, players and court and the different team positions. But, more importantly, it shows how the techniques of offensive and defensive play by giving multiple photographs that demonstrate each move step by step.Both would be useful for the novice player or the veteran looking to sharpen his (or her) skills. Really recommended. Matt Christopher wrote a lot of books about sports and every one I've read has been good. This one is about a middle school basketball team. Mel Jessen is new to the school. 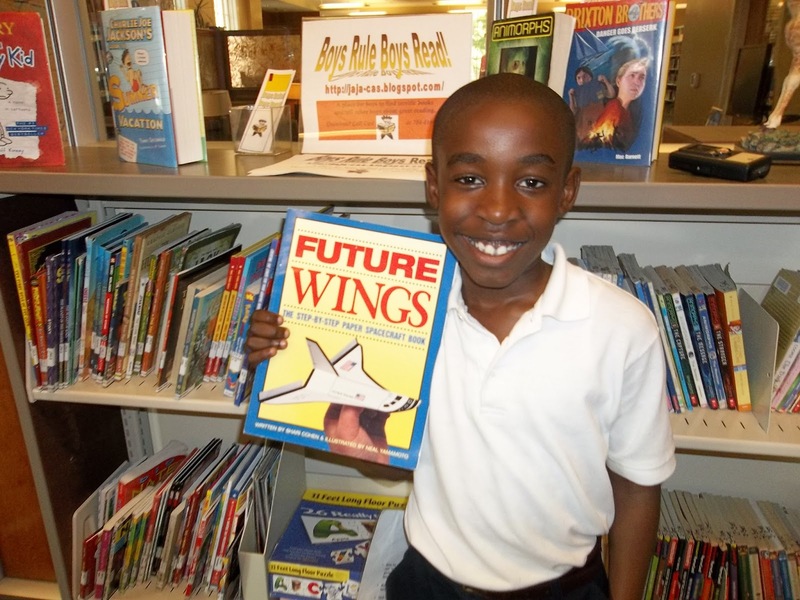 He's also one of the few African-American kids in the school. One of the other kids won't pass to him even when he's in the open. This team has a good chance to win the season--will this other guy get over it for the good of the team? And will the coach intervene or just ignore the situation? This is another good quick read. 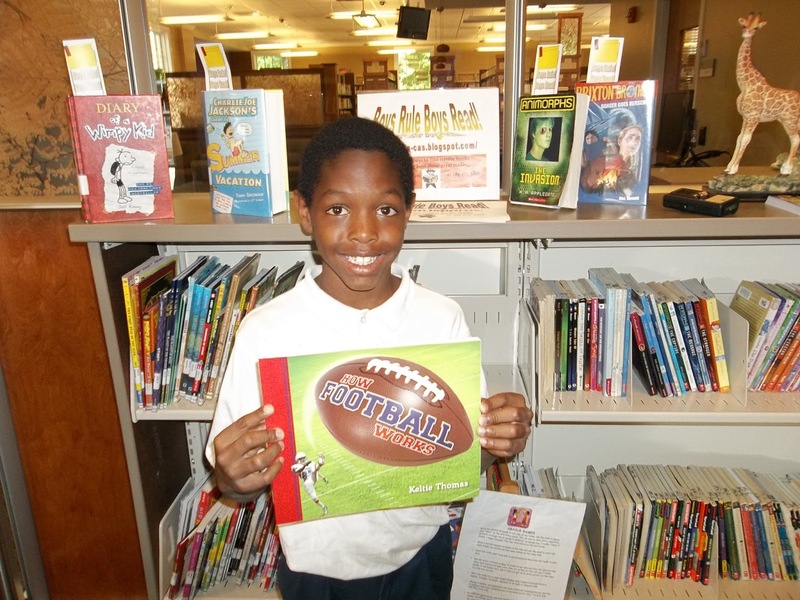 Matt Christopher makes every game exciting, especially the season's final game. And this book was written way back in the day when prejudice was more common. It's hard to believe now that it was such a problem--or is it still a problem? Have any of you reader guys encountered it? Or do you see it on your teams? OK, guys (and Heat and Spurs), play hard and let me know what you think about these books! Must be brief today--busy day ahead. I'll recap what I said last night. I completed two books, Ice Drift by Theodore Taylor and The Basket Counts by Matt Christopher plus some some inspirational grownup reading (like Centuries of Meditations by Thomas Traherne, a wonderful book from a man iN the 1600's) for a total of seven and a half hours and about 380 pages. Not very impressive, you say? Well, not really--especially when you compare my effort to Ms. Yingling, who did 30 HOURS!! My MANLY hat is off to you! But I had many other things to do this weekend, so I read when I could. So remember, guys, give things your best shot, even when things get in the way, and you'll be a MANLY MAN like the IRON GUY!! Hey, hello, and how-de-do, everyone in blogland. This is one tired Iron Guy, checking in briefly with my progress on the 48 Hour Book Challenge. I wish I could say I was worn our from reading but I'm actually tired out from the family obligations I mentioned in the last post. REAL MEN carry out their duties but they also get REAL TIRED! Anyway, I struggled on MANFULLY between my duties and actually read two books (plus some random grownup stuff that I didn't finish) in about seven and a half hours. One was Ice Drift by Theodore Taylor. Don't have the energy to give it a full review but it was good. A survival story about two Inuit boys adrift on an ice floe in the middle of the Arctic winter. The second was The Basket Counts by the terrific Matt Christopher. I don't think he's written a bad book. It's short, good and recommended for any boy who likes sports. And, guys, if you're what the grownups call a reluctant reader--a guy who doesn't like reading--then this could be the book for you. I read it in one sitting and it kept my interest the whole time. 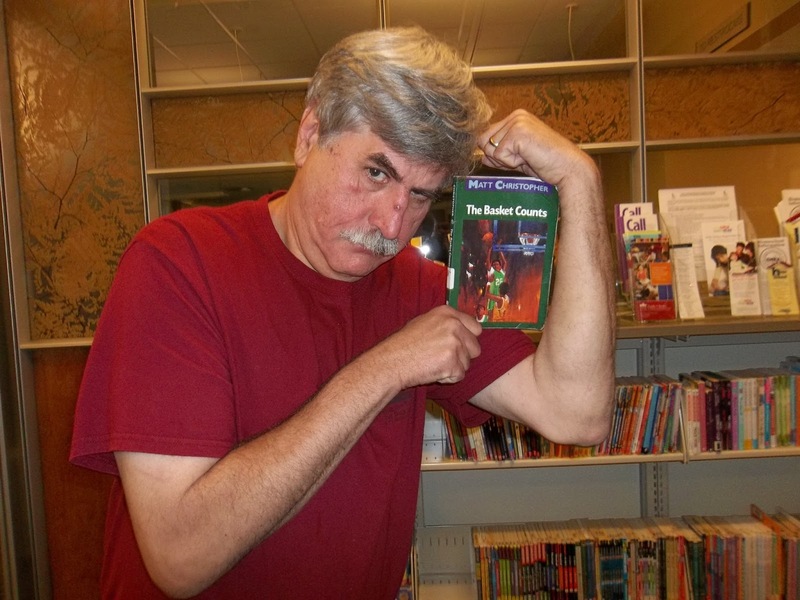 Besides, the Iron Guy doesn't believe there are guys who don't like reading--only guys who haven't found the right stuff yet!! Look for reviews of these books another time. And thanks to all of you who've sent comments. I'll try to send some back. The 48 Hour Book Challenge--Just the Thing for the Iron Guy! Hey, all fellow reading fans! 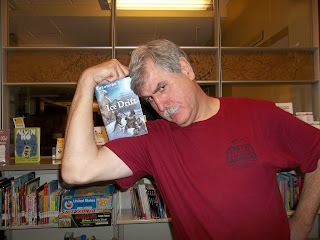 Today marks the beginning of that annual test of the Iron Guy's endurance, determination, and ability to hold a book. 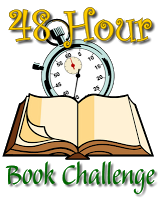 Yes it's the 48 Hour Book Challenge, that yearly contest to see how many hours one person can read in a weekend. I've done this in the past and it tested my powers of strength and will to the max but I rose to the challenge and triumphed in true MANLY MAN fashion! 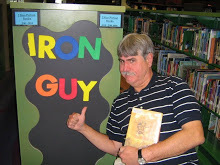 In other years, the Iron Guy used the Book Challenge as an opportunity to raise money for the library but it didn't work out this year. Which is good because I have a lot of family obligations this weekend and, as we all know, REAL MEN take care of their family obligations! So, instead of finding long stretches of reading, I'll grab an hour here and a couple of hours there and see how many I can fit in. I could have just blown the whole Book Challenge off, saying I was too busy, but that's not the MANLY MAN way! Too busy to read? Too busy to be an inspiration for all the thousands of boys who enjoy reading and look eagerly to the Iron Guy as a shining example? The Boys From the Read to Achieve Club Collect Their Rewards! Greetings, fellow reader guys!You may remember that the boys from the Read to Achieve club at Eastover Elementary School in Charlotte sent it a bunch of great book reviews. 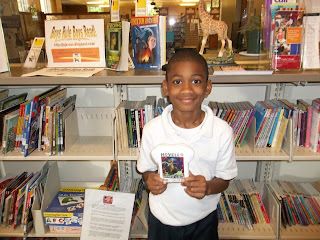 (See that post here) You may also remember that all boys can come to the Myers Park library and pick out a free book from our ultra-cool prize box after they send in their first reviews. Well, the awesome guys from the club came here last week to do just that. 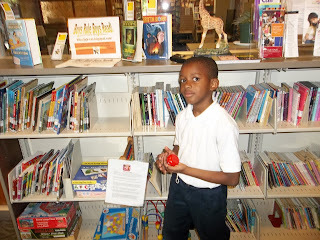 Here are a bunch of photos, showing off these great guys and their great prizes. First, we have Jakobe C. He chose a book called Alien Detection. 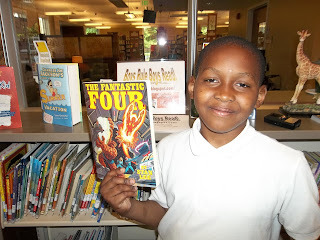 Hotboy (also known as Giovanni) chose a Fantastic Four comic. 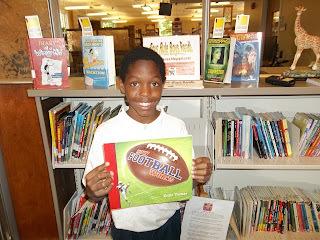 Nathaniel #F16 got this great book called How Football Works--see my review review here. 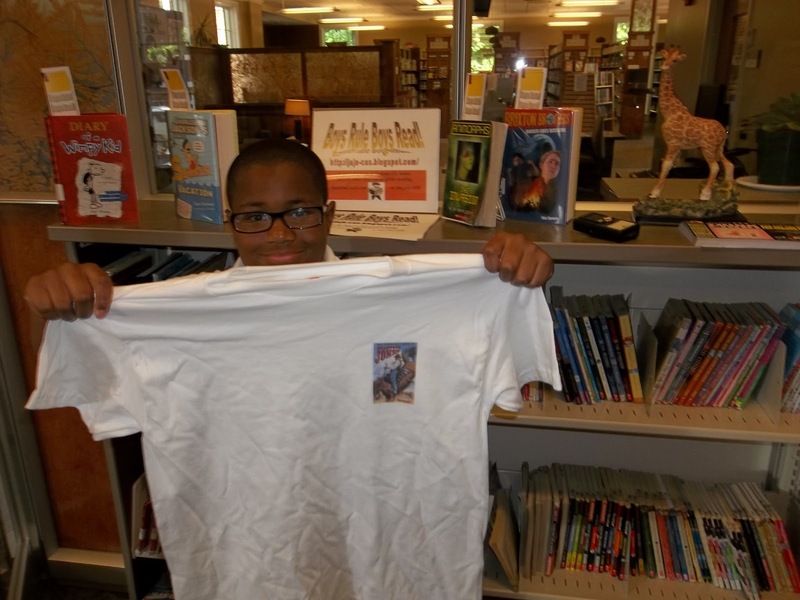 Zaire picked a t-shirt from our Novello reading festival. Izaiah got a t-shirt featuring a terrific book called The Adventurous Deeds of Deadwood Jones--see my review here. 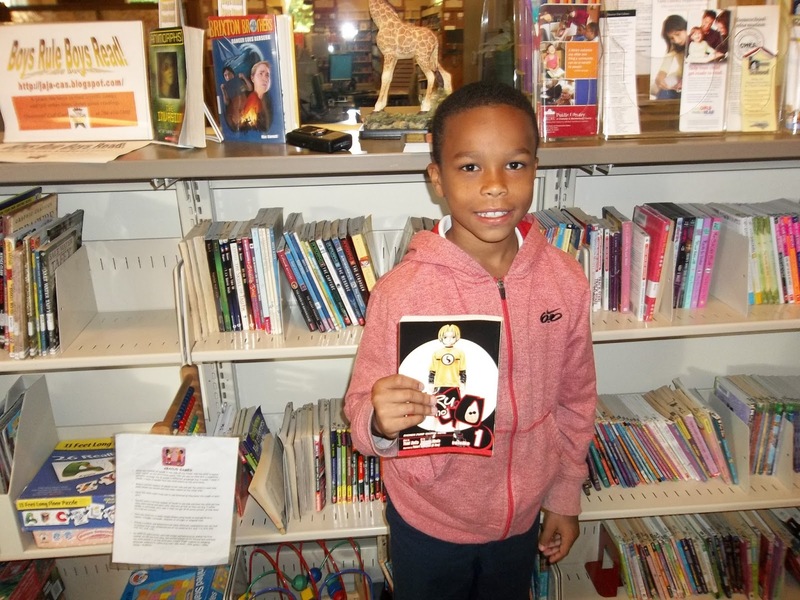 Chicken Master (aka Jalen) chose a Hiruku graphic novel. 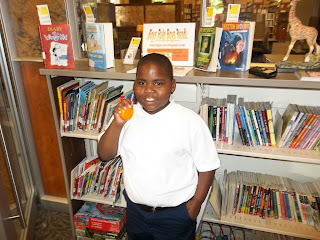 --and so did Jackson (aka Jestevie)!